As online publishers grow in both volume and reach, the Internet becomes increasingly saturated with content. Text, images, and videos are all vying for your audience’s attention, but there’s something at the center of it all: the headline. A great headline is pivotal in piercing through the digital noise. With the right wording, it can increase traffic by 500 percent. However, simply going after the “shock” factor isn’t enough to guarantee an audience. Few of today’s readers fall for this type of clickbait. Although eight out of 10 people will read your headline, only two out of 10 will go on to read the rest of your content. To explore how to formulate a headline that generates the most page views and shares, Buzzstream and Fractl decided to take a different approach: We looked at a set of low-performing headings to identify key patterns and distinctions. For our data set, we turned to BuzzFeed, a publisher that dominates in social shares. Using BuzzSumo, we pulled all the English-language headlines between April 2014 and April 2015. We organized headlines by the first two words, and any that began with a number received a value of “X” (e.g. “X Pieces” or “X GIFs”). We narrowed our sample even further by only including those titles that had at least 10 records, leaving us with more than 5,000 titles and their corresponding social shares. We looked at how these titles were being shared on popular social platforms, along with unique patterns of speech. 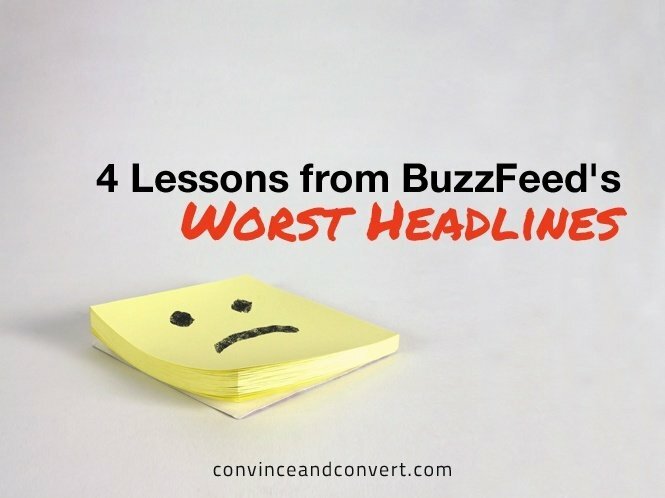 Here, we’ll look at four key insights that will help you create a headline that ensures your readers’ engagement extends throughout your content. A large part of our analysis looked at the bottom of the barrel—the lower quartile—where shares per article maxed out at a little more than 32,000 (In comparison, the most shared headline earned more than 115,000 shares per article—nearly 113 percent more shares). When looking at the most popular two-word clusters in the bottom quartile, nearly 40 percent could be classified as questions. When compared to the top 15 headlines, which earned 83,475 shares, question headlines earned more than 70 percent fewer shares. “Are You” earned fewer than 15,000 shares per article—nearly 160 percent fewer than “X Pictures,” one of the highest-performing titles. The headline earned the least amount of LinkedIn and Pinterest shares—only one per article on LinkedIn. It was one of the 10 lowest-performing headlines for three social networks: Facebook, Google+, and LinkedIn. Aside from earning the lowest number of shares overall, “Community Post” also earned the lowest number of Twitter shares—fewer than 200 per article. It earned its fewest shares from LinkedIn and Google+ (fewer than 1 percent each),while it earned a majority of its shares (96 percent) from Facebook. “Community Post” was also one of the 10 lowest-performing headlines for three social networks: Facebook, Google+, and Twitter. One explanation for this poor performance: These headlines also had the most variation. After analyzing the top three-word combinations for the lowest performing titles, “Community” Post only had two words (“things” and “you”) that were more frequent than others, while the remaining words were all statistically the same. Facebook continues its reign in the social-sharing sphere: The social media giant earned 85 percent or more shares for the 10 top-performing headlines and 70 percent or more for the 10 lowest-performing headlines. Although Pinterest is the only other social network to exceed four-digit shares, seven out of 10 of the lowest-performing headlines for the site were unique to the platform, which means that it had very few low-performing titles in common with other networks. Google+ and LinkedIn earned some of the lowest shares for any of the low-performing headlines: Google+ secured its only three-digit share in “X GIFs,” while the rest remained at 33 shares or fewer. LinkedIn earned fewer than 10 shares in eight of the lowest-performing headlines. We looked at the top five three-word combinations for the 10 lowest-performing headlines and the most popular two-word clusters in the bottom quartile to see if we could uncover any trends in patterns of speech. Our results revealed that headlines that use specifics instead of generalities (e.g. “whiskey” instead of “alcohol”) are common in articles with fewer shares. References to two specific holidays, Christmas and Valentine’s Day, were found in the most frequent three-word combinations, for “X GIFs” and “X Gifts” respectively. Although the Internet (and particularly BuzzFeed) can seem full of cats and celebrities, “Cats Who” and “Taylor Swift” were two of the most frequently used two-word clusters in headlines that earned low shares. The biggest takeaway from our research? Don’t underestimate the value of a headline. The 10 lowest-performing headlines earned 415 percent fewer shares than the 10 highest-performing. Although a headline shouldn’t take as much effort to create as your latest post, you’ll want to set aside a solid amount of time to optimize social traction. Be sure to review this deck, which compares how certain synonyms outperform others and which months low-performing headlines are shared the least, before coming up with your next headline. Combined with what you learn from high-performing headlines, you’ll be able to create titles that encourage audience engagement beyond just a click.